The church is dedicated to Saint Mary, the mother of Jesus and to the Roman Saint Laurence who tradition says was martyred by being roasted alive on a gridiron. His feast day is 10th August; from 1251 the annual Bolsover Fair was held on that date and may have lasted to the 15th August, the feast of the Assumption of Mary. The church is a Grade II* listed building. 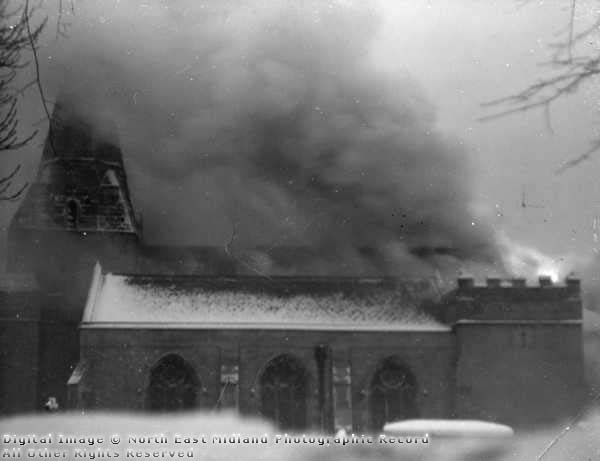 Although it was gutted by fire in 1897, rebuilt in 1898 and damaged again by fire in 1960, many important features were preserved including Saxon artifacts, the 12th century Norman Tower, 17th century Crypt and Cavendish Chapel (with 18th and 19th century additions), and Victorian developments including the fine ‘Christ the King’ east window, dedicated to the memory of Lady Augusta Cavendish-Bentinck, the last Baroness of Bolsover. More recent features include the Remembrance Corner and the Remembrance Window for the men from Bolsover who fell in the Great War (1914-1918). The Willis organ was installed at the west end in 1962. Bolsover’s coalmining heritage is evident in the Coalite Corona, miner’s lamp, National Union of Mineworkers Banner, and the 1990’s engineering technology underpinning the Tower. Bolsover was mentioned as ‘Belsevore’ in the Norman Domesday Book (1086). Although there was no written reference to a Bolsover church in Domesday, several Saxon carved stone artifacts, including a decorated slab coffin lid, a hole-stone with the sign of the cross, and corbels discovered during reconstruction, are evidence of timber-built, pre-Norman place of Christian worship. The farm animal head stone corbels surviving from that church have now been set into the wail overlooking the Choir stalls. Natural hillsides, cliffs and woods, together with defensive earthworks, protected Bolsover’s pre-Norman settlement. These were all assimilated, along with the church, into the Outer Bailey of the enclosed, hilltop, motte and bailey fortress, founded by Lord of the Manor, William Peverel. William was the allegedly illegitimate, but nevertheless favourite, son of William the Conqueror, and Keeper both of Bolsover Castle and Peveril Castle at Castleton in the Peak District. The Late Norman Tower, built in the locally quarried magnesian limestone, is a surviving part of the stone church built in the late 12th century. 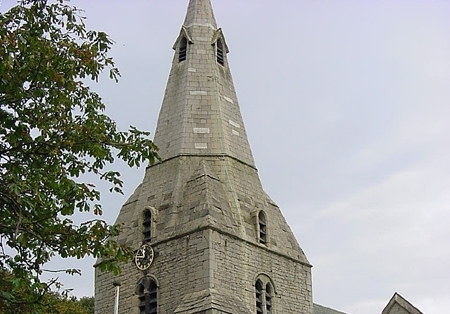 It supports the original, broad shouldered, broached-spire, roofed with magnesian limestone slabs. The Tower now houses 8 Victorian Bells tuned and hung for change ringing. A 13th century bell pit used for casting the medieval church bells in-situ was discovered during excavations under the tower (click here for video clip). Transcripts, originally from Darley Abbey near Derby, indicate that in about 1150, the Younger William Peverel’s wife, Avice of Lancaster, ‘gave the church at Bolsover to Darley Abbey’. William de Ferrers, Earl of Derby and Keeper of Bolsover Castle confirmed the gift in about 1220. Bishop Stavensby of Lichfield established a vicarage at Bolsover but Darley Abbey maintained its estates in Bolsover. In 1229 Darley Abbey received royal approval of the gift from Richard I. This was confirmed by his brother King John, and lasted until the dissolution of the Monasteries by Henry VIII in the 1530’s. Then all church premises were rented out to the incumbents. 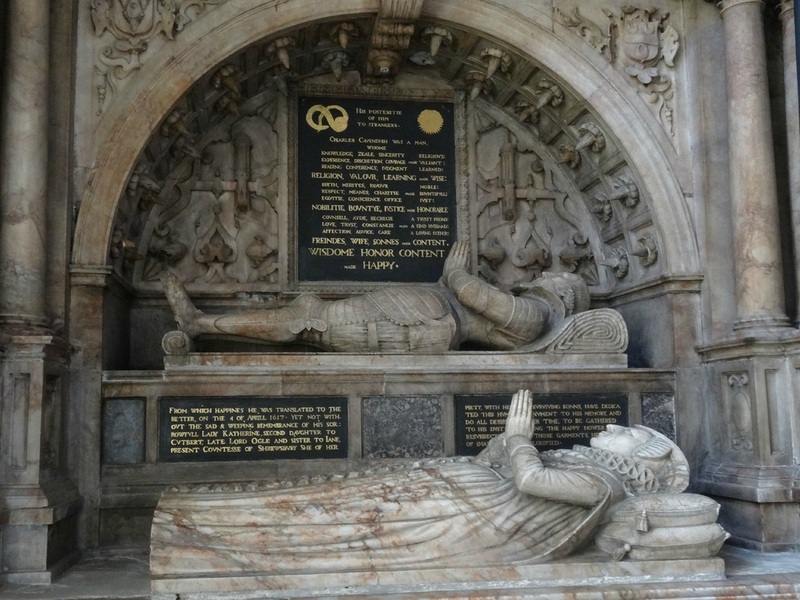 As Lords of the Manor, the Welbeck branch of the Cavendish Family and their successors, and the Hallowes Family from Glapwell who are remembered in the Lady Chapel, became patrons and impropriators of the Bolsover benefice. In 1620 the Cavendish Chapel was added to the church at the east end of the south aisle. It houses two splendid marble monuments. Ecclesiastically, the Parish of St Mary and St Laurence is in the Deanery of Bolsover and Staveley which was formerly part of the old Scarsdale Hundred (administrative unit) recorded in the countrywide Hundred Roll drawn up for Edward I in 1274. This was for administrative, military, and judicial purposes in common law. The parish at that time was in the See (Diocese) of Lichfield, where it remained until 1884 when it became part of the Diocese of Southwell. The Parish became part of the present Diocese of Derby in 1927. Moreover in 2012 Bolsover’s Parish’s first woman vicar; the Reverend Rachel Gouldthorpe was installed by the Venerable Christine Wilson the first woman Archdeacon of Chesterfield, attended by the Reverend Helen Guest, the first woman Rural Dean for Bolsover and Staveley Deanery. 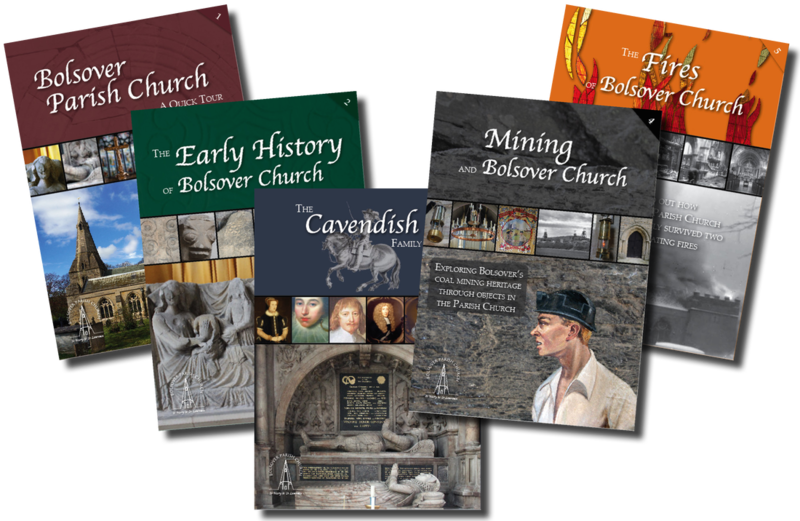 ​This pdf contains educational materials for Key Stages 1 and 2 (and adaptable for KS3), devised to help children get the most out of visiting Bolsover Parish Church, and to help teachers or church members feel confident running such a visit. Also available as a resource pack and on CD by request. Contact us for a copy! Subjects include: Introducing a church building; fonts and baptism; the altar, Holy Communion, weddings; the Bible and church art; worship traditions and music; the church in the community at Easter, Harvest and Christmas; symbols; vestments and colours; church architecture; names and people (including the Cavendish family and looking at family trees).